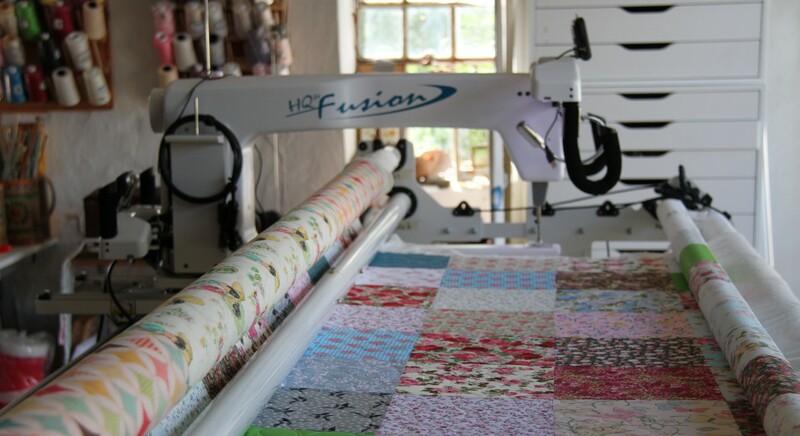 I spent an afternoon at Helene’s Juul’s shop http://www.helenejuul.dk/bestilling.htm and offered 50% longarm quilting vouchers for that day only. Annette was one of the lucky ladies to get a voucher and are the first to be finished. The first one was a twin size quilt with hand stitched apples all over it. WE decided to costom quilt the apples with matching thread and do a simple on the black background in a black thread. I quilted a tiny ladybug on each cornerstone for run. Quilt number 2 was a super little cot size quilt which I quilted using a paper panto edge to edge design to match the flowers in the fabric using a lovely super sheen purple thread.